Everyone loves owning a piece of the business! Here’s exactly how to set it up and make it work — while you maintain control. 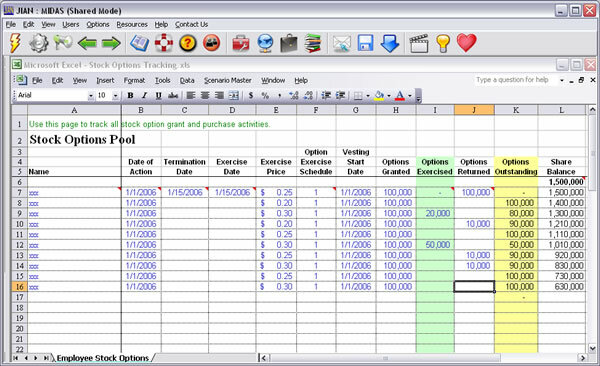 Stock Options Builder is a software system that manages a collection of sample employee stock options template documents, professionally formatted in Word, that you can easily edit or reformat to your liking. 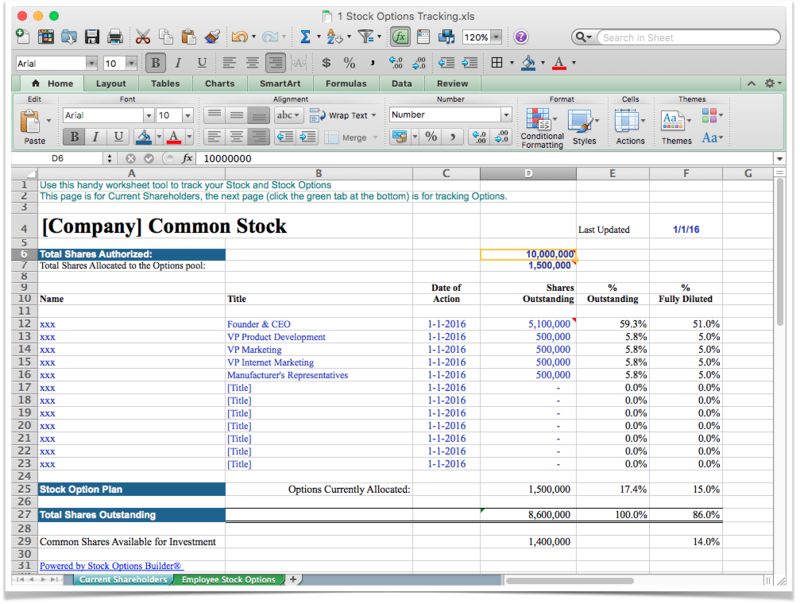 Stock Options Builder also includes a handy spreadsheet template in Excel for managing and tracking your executive and employee stock ownership and options — just fill in the variables and print! With the opportunity to own stock in your company! Nearly 134,000 people were polled recently — and 61% of them said this motivates them to perform their jobs at a higher level: Having a financial / ownership stake in the company! Align the risk and reward of employees betting on an unproven company. Reward long-term value creation and thinking by employees. Encourage employees to think about the company’s holistic success. One of the easiest, best, and relatively economical incentives to motivate valuable executives and employees is to give them ownership in your company through options to purchase shares of stock. Stock options are great for rewarding employees, contractors and other contributors to your business for their continued support, contributions and long-term commitment. They will feel the ownership, and enjoy the reward of staying the course and helping you to build your business. Why stock options and not just shares? If you gave your employees the actual shares now, they would be immediately liable for income tax based upon the value of the shares today. With stock options, you are promising them that they can buy shares in the future, based upon your share price today… since you haven’t actually paid them anything, therefore there would be no tax liability. So, stock options are the way to go. 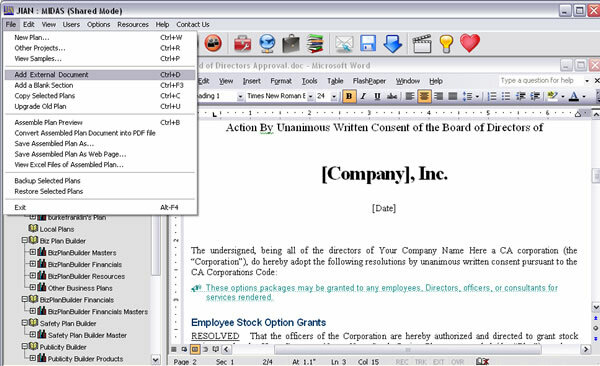 Your executives and employees can purchase only the stock option shares they earn: Vesting gives executives and employees the right to purchase an increasing percentage of their shares as time goes by… For example, using a 5-year stock options vesting schedule, an employee would be eligible to purchase only 20% of their stock options at the end of the first year. This way, if an employee or executive quits (or you must fire them), they can purchase only a prorated fraction of their original allotted number of stock options based upon the amount of time they actually worked for you. Forfeited shares go back into the option pool. Complete sets of both Incentive / Qualified Options Plan AND Non-Qualified Options Plan documents are included. 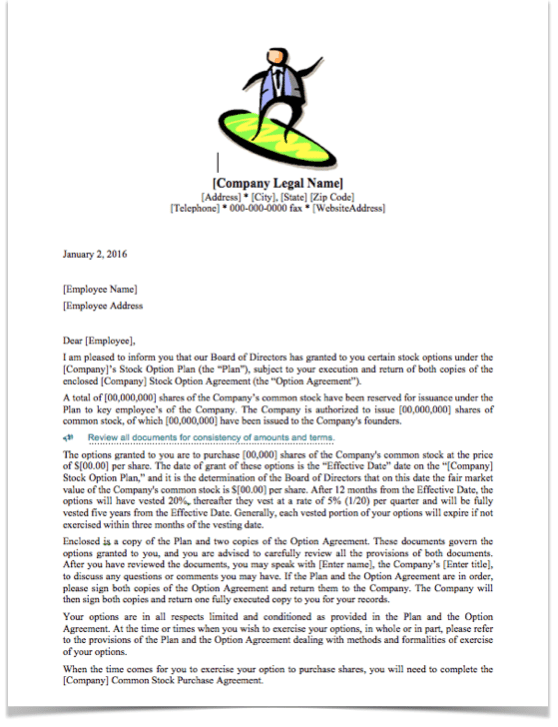 Dear employee… Here is the paperwork that says, “You get a piece of the action…” Read these documents, sign them, and file everything for the future — you will share in the wealth as the value of the company increases. It’s actually a formal letter explaining the contents of the packet that you are giving them. This makes the incentive real in the minds of your employees and partners. All the benefits of owning shares (except voting rights) without the tax liability — pay for the shares and the taxes when the value has been built. Usually when your company is acquired or goes public, a simultaneous transaction is created whereby you and your employees purchase the options and immediately receive the proceeds. Describes all of the legal details of a properly executed incentive stock option plan. What you and they can and cannot do, vesting, what to expect, dates, contingencies, disclaimers, etc. This handy information sheet further explains many of the details involved in an Incentive Stock Option Plan. When it’s time to actually purchase the stock, you have the paperwork to complete the process. The formalities are serious. This makes it official. We make sure that you do it right. Fill in who gets how much stock, have your Board of Directors sign it, and you have officially approved granting stock options to your people. Use this handy form over and over again whenever you want to issue more options. While we recommended purchasing some nice certificate paper at your local stationery store, we provide the template for printing your actual certificate on the front, as well as the restrictive legend on the reverse. All of this saves significant legal time! Use this Excel spreadsheet to list all of your shareholders as well as option holders. Keep track of when you gave the options, the option price, vesting — the worksheet automatically calculates the balance of shares available for investors, other employees and contributors. Also keep track of the details of your executive and employee stock options allocations — automatically calculates balances. We’ve been using this system ourselves for many years as people have come and gone, and it keeps everything clean and simple! Like everything we make, it’s made to be customized any way you like. FYI… Be careful talking in terms of % ownership! Many people seem to get hung up on what percentage of the company they own at any given time. If you need to sell more shares to raise capital or hire a new person, everyone’s ownership piece of the pie is going to dilute. It’s crazy-making to be constantly looking over your shoulder and worrying about what your people think is their percentage of ownership in your company. Constantly recalculating and discussing your percentage of ownership is a psychological nightmare especially for management trying to maintain people’s desire to work. You can buy complex software to keep track of these changes as people come and go (or use the simple worksheet here), as well as when investments are made, but be careful talking in terms of % ownership. It’s OK to talk percentage at the initial stock allocation (including vesting schedule), but since the % of company ownership will change constantly, it’s the wrong thing to focus on — going forward, it’s best to speak only in terms of number of shares. The idea is that each person has their shares and everyone gets rich the same way ⇒ share price! Otherwise, you spend too much time managing expectations and refereeing who owns how much. You just don’t need your team distracted from doing what they can to increase the value of their shares. Your focus immediately after getting options or shares should be simply on the number of shares you have and the value per share. What you can be doing to increase the value of the company?!? No new programs to learn! 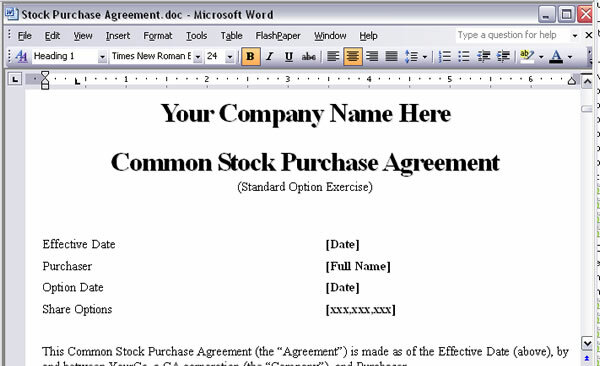 Stock Options Builder is easy to use and works with your familiar Microsoft® Office software. Our system manages collections of Word and Excel files and enables you to easily manipulate and combine them into a contiguous document. Prints to PDF as well. You can do this yourself! You can put your complete executive and employee incentive stock options compensation plan in place yourself for a fraction (a very small fraction) of the cost of having it written from scratch. Then have your attorney (please see a specialist) or our affiliated law firm review it for completeness. Stock Options Builder is further supported by the Burk & Reedy Law Firm. If you have question or need further advice you can call them for professional legal counsel (fees apply). Go forth and build your company! With a proven stock options plan in place, you can motivate your executives and employees to increase profits, improve efficiency, and enable you to grow. Download Stock Options Builder and get started now. Includes everything to get this project done right! Stock and Options compensation for your executives and employees—a piece of the action… “Golden Handcuffs”… Managed your way.